A $3 Ride-All-Day pass allows you to ride from 6:00 a.m. until 6:00 a.m. the next morning. Our friendly and knowledgeable drivers will be glad to take you down to our South Division Street Transit Center or to the North end Transit Center or anywhere in-between. Don’t forget, with your $3 pass, you can transfer to one of our Park & Ride buses at no additional cost and go to our beautiful West Ocean City Park & Ride facility. Getting around OC is now easier than ever! Coastal Highway Beach Buses - S. Division Street Transit Station to/from 144th Street Transit Station. Download the TransLoc Rider App for iPhone or Android, or click here for the mobile web map. Text your Bus Stop ID number to 414-11 when you're at the bus stop. Plus, if you don't have cash to pay for your fare, don't worry! You can pay straight from your phone using the EMoney app. Download it now for your iPhone or Android device. Learn more at OCemoney.com. The Bus – "Express Service"
For the added convenience of our special event attendees, the buses will be available for an "Express Service," traveling directly from specific locations. The exact fare is $3.00 per day. Fare is transferable to Coastal Highway and Park & Ride Buses. Please review the "Express Service" schedule for specific dates and time of service. Thursday - Saturday: 9:00 a.m. to 11:00 p.m. Everyday from 3:00 p.m. to 11:00 p.m.
Tram fare is $4.00 per person, per boarding, one way ride. Discount fare punch cards are available at $26.00 for 8 rides. Inquire at either Tram Station or with a Tram Conductor. New unlimited ride pass, which costs $8.00, a passenger can get on and off the Boardwalk tram as much as they like between the hours of 11:00 a.m. and 4:00 p.m. daily. The unlimited ride pass will not be available during Springfest, Memorial Day Weekend, OC Air Show, July 4th, Labor Day weekend, or Sunfest. Unlimited ride passes will be sold at both north and south ticket booths and on any tram. Please note: The tram operation is subject to prevailing weather conditions. See the station operators or call (410) 289-5311 or (410) 723-1606 for further information. The Tram Service is now closed and will resume for Springfest on May 2-5, 2019. Getting around Ocean City won't break your vacation budget. In fact, it will only cost you a few dollars! It's the 'Best Value" ride! Ocean City municipal buses travel along Coastal Highway 7 days a week, and you can ride for just $3.00 per day. Our safe and clean buses are reliable and convenient and offer multiple stops along Coastal Highway, so your favorite OC attractions are easily accessible and within walking distance. 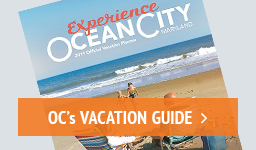 Ocean City buses also run to and from the West Ocean City Park & Ride facility seasonally. After all, you're on vacation; why not give your car a break as well? Approx. every 20 minutes, 6:00 a.m. to 2:00 a.m. unless otherwise noted or posted. The Park N Ride Beach Bus service ends at 10:00 p.m. on Sunday's of Springfest, Cruisin', Bikefest. Sunfest and other events unless otherwise noted. **When Park n Ride Beach Bus is not in operation in the off-season, transportation to/from South Division Street Station to Park n Ride off Rt. 50 is provided by Shore Transit. West OC Park -N- Ride is Closed for the Season September 24, 2018 to May 1, 2019. *Please refer to Shore Transit public schedule for additional transportation options. The shuttle bus service between the West Ocean City Park & Ride and the South Division Street Transit Center in downtown Ocean City now includes a stop at the Ocean City Tanger Outlets. The bus travels from the South Division Street Transit Center to the Outlet stop and then continues to the West Ocean City Park & Ride before departing again for downtown Ocean City. Seasonal service only. Exact fare of $3.00 for Ride-All-Day. In accordance with the American with Disabilities Act (ADA), Ocean City Transportation offers curb-to-curb, or curb-to-beach service to eligible disabled residents and visitors of Ocean City. All eligible patrons may call the Dispatch Office at (410) 723-1606 to make a reservation for the Paratransit van 365 days a year. Reservations need to be made at least one business day prior to service. Paratransit service is offered from 7:00 a.m. to 11:00 p.m. daily. Our staff of well-trained drivers offers our patrons a safe ride to their destinations. We can even deliver you right to the front entrance of Springfest or Sunfest events. We can also connect you to DART at the North end and Shore Transit at the south end, if necessary. "The Bus" for Coastal Highway $3.00 for an interchangeable Ride-All-Day pass from 6:00 a.m. to 6:00 a.m. the following day. West Ocean City Park & Ride $3.00 Best Value for the shuttle service and free parking. ADA ParaTransit $3.00 Ride-All-Day. By appointment/reservation only. Call (410) 723-1606. Senior citizen bus passes for residents and property owners, 60 years of age and over are available. The cost of the pass is $7.00 and it is valid for two years. All applications for bus passes and renewals require proof of property ownership or residency, such as an Ocean City tax bill or drivers license with an Ocean City address. Seniors obtaining a pass for the first time must show proof of age in addition to proof of residency. A senior bus pass allows free rides on the buses and paratransit van (if eligible). For more information, call the City Hall receptionist at (410) 289-8221. A non-resident senior bus pass is available free of charge to anyone 60 years of age or older. This pass will entitle the holder to half-fare passage on the bus and paratransit van (if eligible). The non-resident bus pass is not recognized for reduced or free passage on the trams. For more information, call the Transportation Department at (410) 723-1606 or the City Hall receptionist at (410) 289-8221. Ocean City’s paid parking season starts on April 1st (as it does every year) and continues through October 31st. …what this means is that when you park, you no longer get a “receipt” that you have to put in your windshield. Instead, you enter your License plate at a nearby pay station & the system will recognize your “paid time” based on your vehicle (Note: You must know your license plate number). This will be camera enforced at the Inlet Parking Lot and enforced by Public Safety Aids on the Streets and Municipal Lots. Parking in the Inlet Lot is $3.00 per hour, with 0-30 minutes free for all vehicles, including handicapped. Additional Street Parking & other Municipal Lot parking is $2.00 per hour with one hour free for handicapped parking. A violation of Street Parking & other Municipal Lot parking will result in a physical parking ticket ($50.00 fine) which can be voided if payment is made at a pay station for expired time within one hour of receiving the ticket. A violation of Inlet Lot Parking will result in a mailed bill of time spent in the lot at $3.00 per hour, plus a $25.00 administrative fee. This fee will escalate to $50.00 if not paid within 30 days. Patrons may pay for expired time up to one hour and within one hour to avoid being billed for additional administrative costs. You can download the ParkMobile App and customers are able to pay for parking on street and municipal lots including the inlet lot from their smartphones. More information on the ParkMobile app can be found on our Parking Information page. The Hugh T Cropper inlet Parking Lot is located at the southernmost point of Ocean City. Utilizing this parking lot makes visiting the boardwalk and beach easier and allows the visitor to relax and enjoy their activities – whether it is enjoying the rides, visiting some of the Town’s well known eateries, strolling the boardwalk, or spending the day on the beach. The parking lot has 1,200 parking spaces including 35 handicap parking spaces. There is also a passenger load and unload zone. In order to accommodate our physically challenged patrons, a 30 minute grace period is in place. This allows those person(s) to view the ocean or pick-up an item from the boardwalk. In addition, there are handicap parking spaces located near the beach as well as the boardwalk just for these purposes. However, if the length of time spent in the parking lot is 31 minutes or more, the person will have to pay for the entire time spent in the parking lot, in accordance with the parking fees listed above. Seasonal Service Only Now Closed Until May 1, 2019. We offer so many convenient and affordable public transportation options in Ocean City, that we encourage visitors to leave the driving up to us and give their cars a vacation while in town. The West Ocean City Park & Ride offers free, ample parking at the West Ocean City Park & Ride located at 12848 Ocean Gateway. Not only is the parking free, but the lot offers spectacular scenic views of the bay, surrounding wetlands, the Ocean City skyline and, of course, the gorgeous sunsets Ocean City is known for. Bonus tip: Visit the octagon gazebos and bird watch. Be sure to read the interpretive signs and check out the railroad bridge and brick walkways before catching the shuttle into town. Shuttle service from the West Ocean City Park & Ride is the 'Best Value" $3.00 per day pass. This enables riders to unlimited daily trips between the Park & Ride, Ocean City Factory Outlets and the South Division Street Transit Center and anywhere in Ocean City on the "The Beach Bus". For additional parking information please call (410) 723-1606.